The word ‘egg’, all alone, makes me happy. When I hear it, thoughts run through my head of fried eggs with potatoes, mayonnaise, a rich custard or a Spanish tortilla omelet…. If there was a food that I simply couldn’t live without, it would have to be eggs. Although I love eggs for the diverse range of foods that they help make, my favorite thing about eggs is that they are a traditional source of complete protein and nutrition. This couldn’t be more true than in the Spring. Spring is the season for pastured, farm fresh eggs. Yes, eggs are available year round from the farm or grocery store, however, as the buds start to bloom, grasses start to grow and microbial bugs and earthworms start to proliferate, pastured chickens enjoy their buffet. With this buffet comes more vitamins and nutrients. In the Springtime, eggs are at their nutritional peak. ALL photos by Diana Bauman. Vitamin E -prevents cell damage by inhibiting oxidation of lipids (fats) and the formation of free radicals (helps to prevent cancer). Since the industrialization of our food system, it has become apparent that not all eggs contain the same amount of nutrients. Mother Earth News, The Original Guide to Living Wisely, has shared study after study comparing the nutrients in pastured eggs versus conventional, grocery store eggs. Knowing this, it becomes very important to buy eggs from a local source. You may be thinking, “I buy organic, free-range eggs from the grocery store”. This is a great start, however, with the demand of “organic” and “naturally” raised products, more companies are jumping on board to sell you what you want. This is great. Our demand of good nourishing food is being met. However, many standards are truly not what you may expect. In order for eggs to be labeled “free-range” a chicken needs to have access to the outdoors. This usually means hundreds of chicken confined to an industrial chicken house with a small slab of concrete to walk outdoors if they’d like. Your “free-range egg” chickens are really spending their lives indoors in a ventilated area and will not have the nutrient levels as described above. If you’re buying “vegetarian-fed eggs”, this is a sure sign that they do not have access to pasture as real chickens are not vegetarians. Chickens live and thrive on a variety of worms and bugs outdoors which only a pasture can provide. As you can see, it is critically important to buy local eggs. 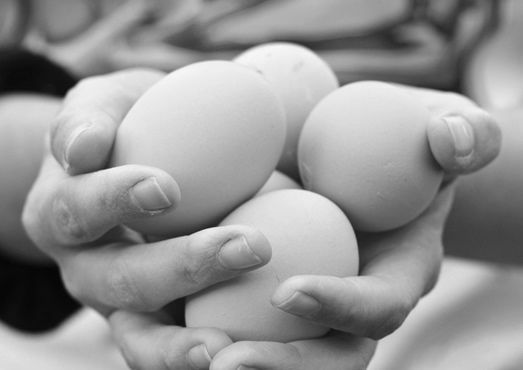 If you need to find a source for local, pastured free-range eggs, visit your farmer’s market or visit www.localharvest.org, a great website to find family farmers in your surrounding area. Or, if you’re like me, raise your own. Coming from a Spanish family, we eat a lot of eggs. Not just for breakfast but fried up and served on the side for lunch, boiled in salads and sprinkled over chicken, fried over picadillo, scrambled into tapas of tortilla Espanola, baked into nourishing crema Catalan and even eaten raw. 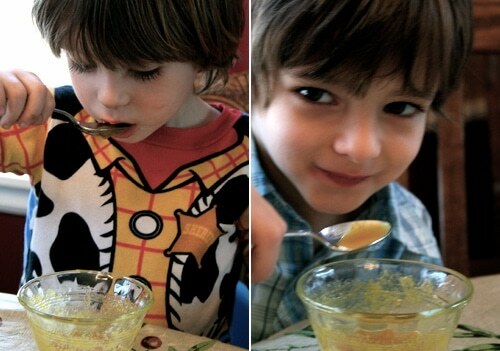 I feed my children a raw egg yolk mixed in with a tablespoon of honey and served as a sweet, traditional dessert. I grew up eating this as did my mother and I’m sure the generations before her did as well. Since my family eats raw egg yolks, it was very important to me to find a local source of pastured free-range eggs. For a couple of years I was buying from a local family farmer who pastured his chickens on five acres of land. After visiting his farm I became quite captivated by the beauty and simplicity of chickens and we decided to raise our own in our backyard city lot. I can’t imagine my backyard without my girls or my farm fresh eggs waiting for me every morning. The simple act of raising your own chickens brings you to the very essence of the miracle of food and helps you understand the importance of raising livestock sustainably. Not to mention, the kids love them. To get you started, I would suggest one chicken per family member plus one. 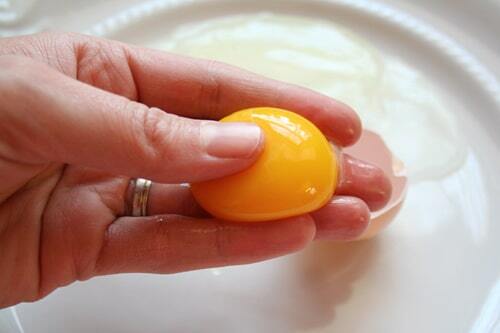 Since 1 chicken will average 5 eggs a week, this will ensure you get at least 2 dozen eggs a week. This is generally the amount of eggs my family goes through in one week. Before you purchase your chickens, make sure you buy them suitable to your climate. Visit My Pet Chicken’s Breed Selector to select the best breed of chicken for you. Build a chicken coop. This is the fun part. 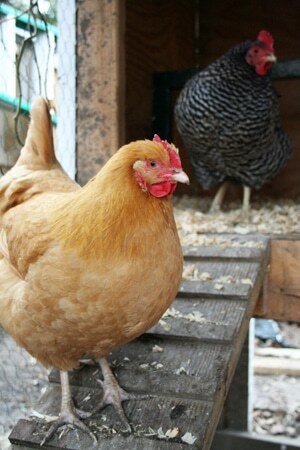 You can build a variety of different kinds of coops. Again, make sure they are built suitable to your climate. In my area we get freezing weather during the winter time. We have an open area allowing condensation to escape in order to prevent frost bite. To get you started on raising your baby chicks to grown laying hens, visit the best online chicken website and forum, www.backyardchickens.com. It’s no wonder that eggs are one of the healthiest and most scrumptious foods that you can eat. I encourage you to take advantage of farm fresh, seasonal eggs and find a local source (or raise your own chickens) this spring to nourish your family. Have you found a local source for farm-fresh eggs? What are your favorite recipes to make with farm-fresh eggs?